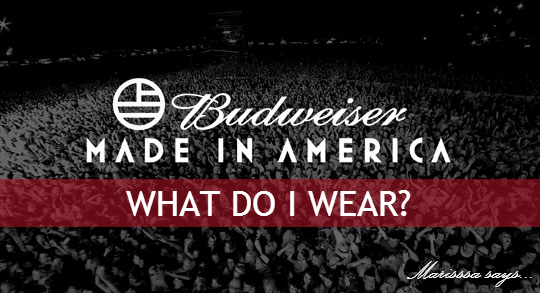 The Budweiser Made in America is rapidly approaching. This is the second year the festival is being held on the Ben Franklin Parkway in Philly on Labor Day Weekend. I think this festival is kind of hard to dress for because the music selection and audience is so eclectic. There's also the issue of the weather. It's Philly, it could be cold, it could be hot, it could rain, you just never know. Forecast right now says 85 degrees and sunny both days, so I planned these style inspirations based on the warmer weather. Keep your fingers crossed! For all my suggested looks, I made sure to consider foot comfort and staying hands-free. This way you can hold on to your refreshing Bud Light while eating a sausage sandwich. Score! Channel your inner Cochella princess for this one. Clearly inspired by Woodstock '69 this look is all about free love and going with the flow. You'll feel breezy in your white crochet dress and comfy in some tan booties. The Queen Bey is clearly the inspiration for this look, but you can't rock a black jumpsuit without some serious attitude behind it. Add an edgy flair by pairing it with a denim vest, wedge sneakers, and a brass ring. I mean it is called "Made in America," it's only appropriate that you should wrap yourself up in the stars and stripes and show your pride for this here fabulous country we call 'Merica. If you plan to spend most of your time in the freedom tent you're gonna need lots of dayglow accessories. Plus it's like a freaking sweat box in there so a crop-top is going to keep you nice and cool, and a bum bag will let you jump around to those crazy beats. This look is all about being easy and breezy for the tail end of the summer. A romper gives you the coolness of a dress, without the risk of a wardrobe malfunction. Depending on weather, you could go for the strappy shoes or booties. There's nothing wrong with a basic festival outfit intended for extreme comfort and enjoyment. Denim cutoffs paired with a loose top and bright or patterned bandeau bra might be the smartest of options. Don't forget your chucks! So what look(s) are you leaning towards? I'm loving the romper look, and probably will do festival fab for one of the days. Homemade ricotta cheese - it's so easy!